When a guest spends the night at my house, I try to make it as comfortable and welcoming as possible. The following are nice touches that do just that. 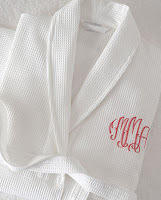 A waffle weave robe with "Guest" embroidered in a pleasing color. I like to place the robe, along with freshly laundered and folded towels, on top of the bed. It is also nice to have a pair of fluffy slippers with "Guest" embroidered on them beside the bed. 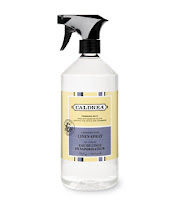 Linen spray beside the bed- I like Caldera in Lavender. A beautiful bouquet of seasonal flowers. 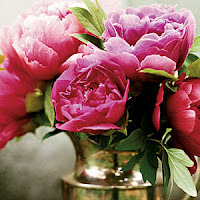 A single flower in a bud vase has the same effect and is equally lovely. A selection of current magazines and a stack of books. 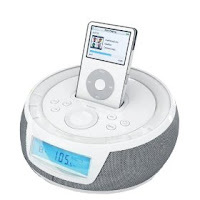 As some people need a bit of noise to sleep, it is a considerate to have an I-Pod shuffle with a soothing mix on it and a docking station with a clock. As an added touch, also do a fun cheerful mix for the daytime. One bottle of water per guest placed on the bedside table. 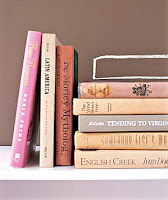 Keep in mind that these are some little touches that I like to use for my guests. The fact of the matter is that a little gesture goes a long way for comfort. It takes no extra money to create a lovely and inviting atmosphere for your guests. * Images from worldofstock.com, bellalino.com, caldera.com, southernaccents.com, realsimple.com, styleassembly.com, icenews.com. This entry was posted on 6:25 AM and is filed under Guest bedroom , welcoming gifts . You can follow any responses to this entry through the RSS 2.0 feed. You can leave a response, or trackback from your own site. I want to come stay at your house!! I do many of the same things & also have a set of white washcloths with "makeup" embroidered on them that I set out on top of each set of towels so that guests use those to take off their makeup & protect the nice towels. Love your idea Gidget! I think that I might start doing this as well :). What great ideas! We rent one of our houses we have in New Hampshire and those would be great touches that wouldn't cost anything but would mean a lot. Thanks so much! Wow, how hospitable of you! I like to make my guests feel welcome, but I don't do nearly as much as you do! My favorite is the waffle with "welcome" written on it. People must love to stay with you! P.S. Thanks for the sweetest little comment you left on my guest blog post on the English Muse! I have stayed at this wonderful house..and it is as stated. You always feel welcomed and loved...It is wonderful, I cannot wait to go back. I do the same thing for my guests except I hadn't thought of leaving linen spray. That's a great idea. We actually have guests next week so I'll get on that. :) Thanks for leaving me a comment today so I could find your blog. See you again soon! It's the little thoughtful things that make a guest feel oh, so much more welcomed. You certainly pamper your guests (as it should be) . . . I always have a small bowl with some fruit in the room as well -- so that they can have a snack if they wish. Fabulous, little ideas that go such a long way in terms of hospitality. I love it!